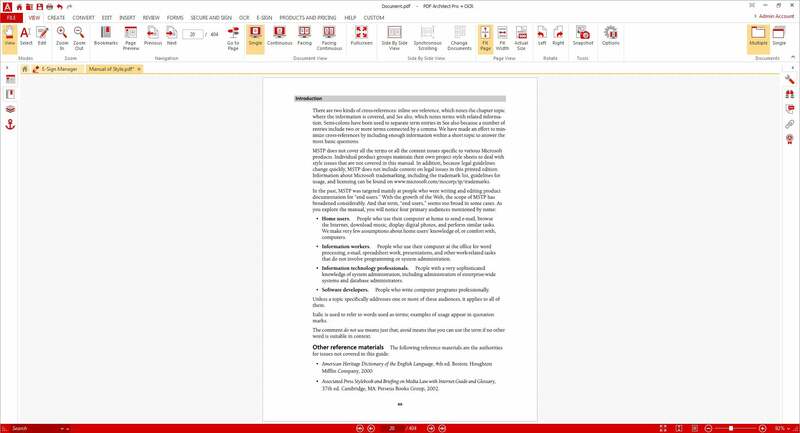 Packs much of the power of Acrobat at a fraction of the price. PDF Architect 6 is billed as the only customizable PDF editor. What that means is it’s offered as a free download and three different paid packages, each containing a specific set of PDF tools it calls “modules.” These modules, which determine how much you can do with a PDF, can also be purchased individually based on your needs. We took a look at the business-ready Professional version, which comes with just about every available tool. 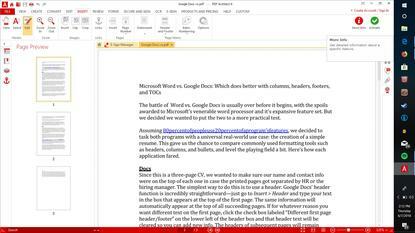 Like virtually every other PDF editor worth its salt, PDF Architect employs an Office-style ribbon interface that organizes tools in a baker’s dozen of tabs. While the first 12 tabs cover common document tasks like creating, converting, reviewing, and securing PDFs, the 13th is an empty “custom” tab to which you can add your favorite tools and create a personalized ribbon bar. A series of tabs in the document pane let you navigate PDFs by page, thumbnail, bookmark, link, or text search. You can create PDFs from scanned documents or from more than 300 file formats. 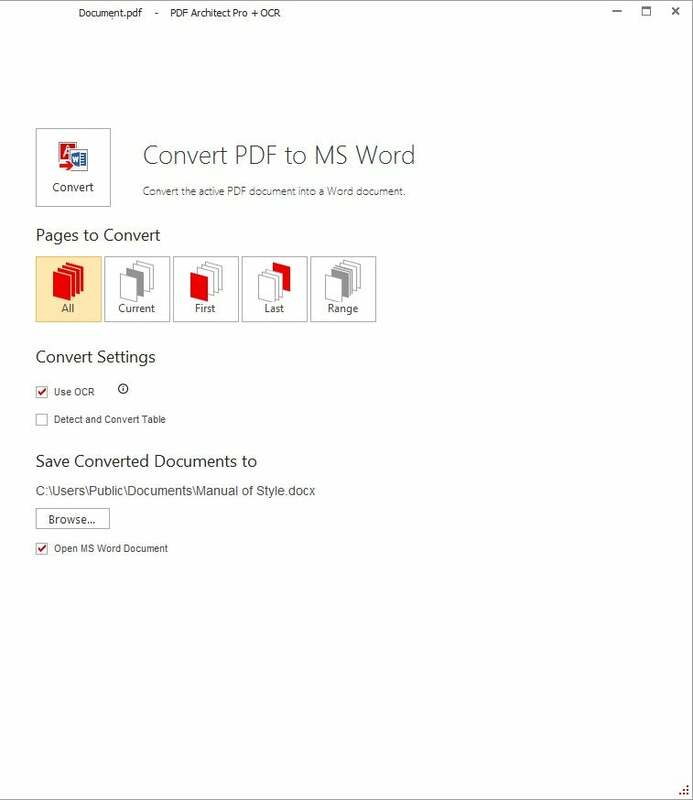 PDF Architect also supports one-click conversion of PDFs to Word, Excel, PowerPoint, HTML, text, rich text format, PDF/A, and image formats. In my tests, it had little problem faithfully reproducing documents in any of these formats. It also supports batch conversion. This review is part of our best PDF editors roundup. Go there to learn about our testing and how all the competitors performed. PDF Architect 6 orgainzes its tools on an easily navigated ribbon. The Review tab includes tools for highlighting, underlining, and striking out text. You can also annotate documents with sticky notes or the customizable stamping tool, and draw on the document freehand or with a selection of predefined shapes. The editor also allows you to compare document versions to track collaborative changes. If a document contains sensitive data that you don’t want some recipients to see, you can secure all or part of the PDF with password encryption, permissions, redaction, or digital signatures. A particular benefit for business settings is an optional e-sign feature that lets you send and track documents for e-signatures from right inside PDF Architect Professional. There are two ways to send for a signature: Quick Send allows you to quickly put a signature field on a document and shoot it out for a single signer, while Advanced Send enables you to more painstakingly prepare and package multiple documents for multiple signers. PDF Architect Professional is available for a one-time fee of $109. PDF Architect Pro + OCR adds the ability to scan documents to editable PDFs and convert images in PDFs to editable text and make them searchable; it costs $139. The Standard version removes the collaboration, form creation, and security features and can be purchased for $69, while the free download just lets you view and create PDFs with limited editing power. PDF Architect can convert PDFs into Microsoft Office formats. The E-Sign service must be purchased separately, but an unlimited option that lifts restrictions on how many signatures you can request is available with any package for $40. PDF Architect Professional is a flexible, easy-to-use PDF editor with all the tools you need to work with business documents. It’s also one of the most affordable. If you need an inexpensive Acrobat alternative that doesn’t sacrifice essential functionality, look no further.